We received messages of many of qmaths followers regarding whu there is an interview in IB ACIO exam, where as Govt has dispensed off interviews of all Group B Posts. In this regard an PGPortal Grievance was filed by Shri Maheshwar and reply has been received which we are sharing with you. Reason: PMO vide their ID dated 9.5.2017 has exempted IB from discontinuation of interviews in respect of five group C posts viz ACIO-II/Exe Technical, JIO_II/Tech, Security Assistant/Exe Motor Transport as a special case. Grievance Description : Respected sir From 2016 central govt had cancelled all interviews .but in intelligence bureau 2017 notification again for interviews are being conducting for 100 marks why sir again. Please reply sir. 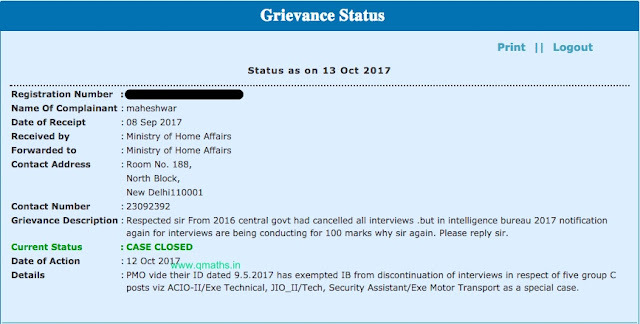 Details : PMO vide their ID dated 9.5.2017 has exempted IB from discontinuation of interviews in respect of five group C posts viz ACIO-II/Exe Technical, JIO_II/Tech, Security Assistant/Exe Motor Transport as a special case.